With the 9th circuit constantly trying to remove President Trump executing orders. Well, this is where it’s good to have the Supreme Court on your side! 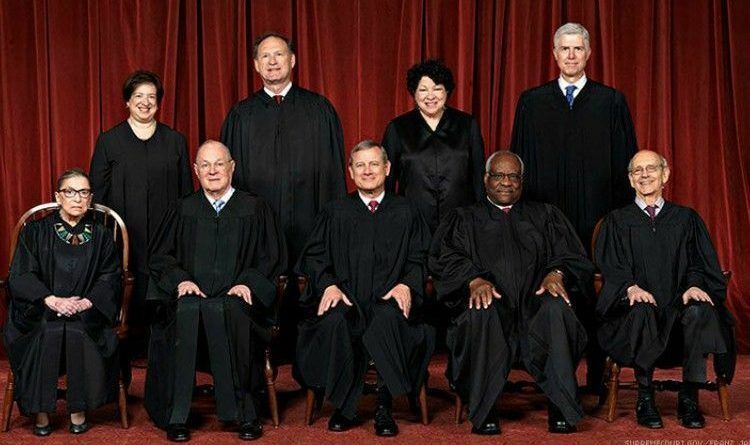 Today the Supreme Court ruled in favor of America! Justice Samuel Alito delivered the opinion of the court, joined by Chief Justice John Roberts and Justice Anthony Kennedy. Justices Clarence Thomas and Neil Gorsuch joined most of Alito’s opinion, though they also wrote to say they do not believe the court had jurisdiction to hear the case. In a rare move, Justice Stephen Breyer read part of his dissent in the courtroom during Tuesday’s proceedings. The justices only read their dissents from the bench when they mean to emphasize their disagreement with the majority. Justices Ruth Bader Ginsburg and Sonia Sotomayor joined his opinion. Justice Elena Kagan was recused because she briefly participated in the case while serving in former President Barack Obama’s administration. It’s a profound loss for those immigrants appealing what are sometimes indefinite detentions by the government. Many are held for long periods of time — on average, 13 months — after being picked up for things as minor as joyriding. Some are held even longer. The ruling is a huge win for the Trump administration’s in their battle against illegal immigrants! The decision reversed a Ninth Circuit ruling, and the court remanded it for the Ninth to reconsider the case. In any case, this is a huge win for President Trump and we need to be proud of Neil Gorsuch!